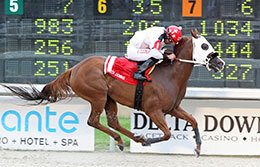 Lightemupwithcharm, under jockey John Hamilton, helds off San Lorenzo Corona to win the $100,000 Delta Downs Classic Stakes(RG2) Saturday night. 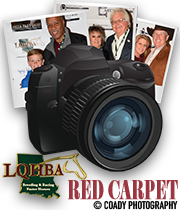 VINTON, LA—JULY 7, 2018—Delta Downs also hosted five additional undercard stakes on Louisiana Showcase Night Saturday worth a combined $340,000 in purse money. 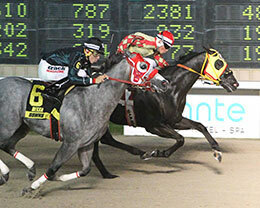 Lightemupwithcharm, under jockey John Hamilton, got away fast then held off a late charge from San Lorenzo Corona to win the $100,000 Delta Downs Classic Stakes(RG2) by a nose Saturday night. Last year's Classic winner Heza Louisiana Dash finished one-length back in third. Coming off a win in the Vals Fortune Stakes(RG2) last month Lightemupwithcharm completed the 440 yards in :21.439 seconds, a 105 speed index over the fast racing surface. It was the sixth career in 17 starts for the 4-year-old son of Sizzlin Cartel. The $60,000 winner's purse boosted Lightemupwithcharm's career earnings to $194,820. Martin Trejo conditions the brown gelding for owner Saul Dorado. Bred by Jumonville Farms, Lightemupwithcharm is out of the Feature Mr Jess mare Grace Filled Charm. Eddie Sanchez had the riding call aboard San Lorenzo Corona for owner Rogelio Marquez, Jr. and trainer Jose Luis Sanchez III. A brother to multiple grade 1 winner Open Me A Corona, San Lorenzo Corona was bred by Jim and Natalie Montgomery. 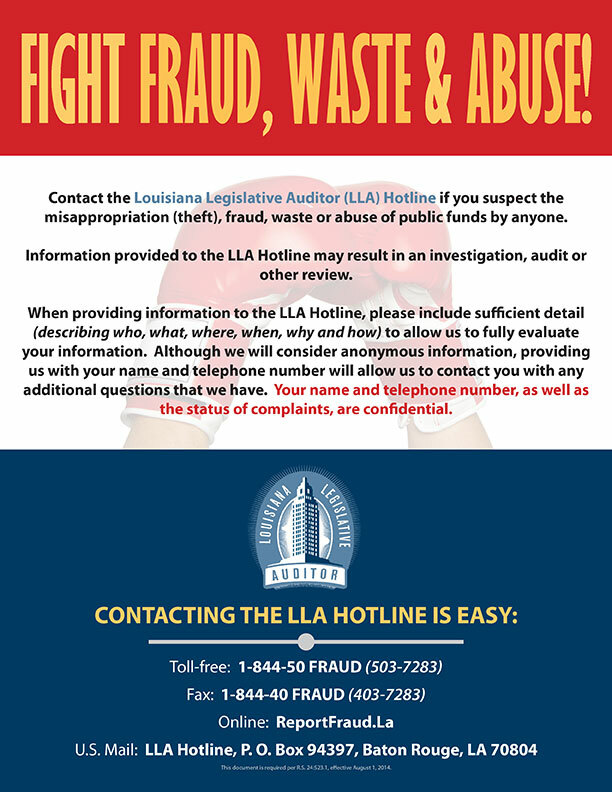 The Coronas Leaving You 4-year-old earned $20,000 for the effort. He is out of the Mr Eye Opener mare In The Open. Multiple grade 1 winner Heza Louisiana Dash eared $11,000 for third to boost his lifetime mark to more than $510,000. AQHA Racing champion trainer Kenneth Roberts, Sr. saddled the 6-year-old son of leading sire Heza Fast Dash for owner T M Ranch. Jumonville Farms and Burnett Ranch bred the brown gelding from the Mr Jess Perry mare Eyejesslovelouisiana. Ridden by jockey Ubaldo Luna, Look To Monte Cristo was much the best Saturday night when he defeated Jw Who Dat by 7-¼ lengths in the $50,000 Live Oak Stakes at Delta Downs. Claude Walters conditions the 5-year-old mare for owner Jonathan Goss. Bred by John Martin from the Bold Pac Man mare Thoroughbred mare Pac For Arkansas, Look To Monte Cristo nearly doubled his earnings total to $66,220 after pocketing $30,000 for the win. A stakes winner at the Delta meet last month, Jw Who Dat earned $10,000 for second to push his earnings total over the $100,000 mark. Eric Palacio conditions the Agouti 6-year-old for owner Fernando Ramirez. He is out of the Heza Fast Man mare Ew Comment. Runner-up Louisiana Dressblues snapped a two-race win streak but still picked up $3,500 for finishing another 1 ½ lengths back to get third. Trey Ellis trains the Jess Louisiana Blue 3-year-old for owner Wilson One Consulting LLC. Easy Acres Performance Horses bred Louisiana Dressblues from the Meadowlake (TB) mare Charlomaine (TB). Under a solid rally jockey Jesse Levario, Heasablackmagic got his neck in front of Sweet Bru to win the $50,000 Flying Breed Stakes at Delta Saturday. 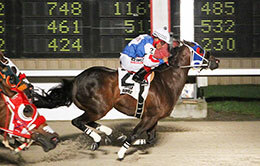 The 7-year-old son of Jet Black Patriot completed the 220 yards in a quick :11.657 seconds to earn a 107 speed index. Trainer Telma Janet Loya saddled the Flying Breed winner for owner Yiret Duran. Winner of last year's Par A Dice Stakes at Delta, Heasablackmagic was bred by Gerald Paul Vidrine from the Toast To Dash mare Toast Of Magic. The $30,000 winners' purse boosted Heasablackmagic's earnings total to $203,390. Runner-up Sweet Bru races for owner Jose Ortiz and trainer Gary Shane Mason. Floriberto Maldonado had the assignment aboard the Embrjuo FG mare out of Dashin Sweetpea by Dashin Bye. Bred by Ceburn Baker Jr., Sweet Bru picked up $10,000 for the effort. Lester Colomb, Jr.'s Bjs Magic Wings finished three-quarter back in third. Saddled by trainer Kenneth Weeks the 6-year-old Dragon Wings gelding earned $5,500 for the effort. Bessie Lea Jeane bred Bjs Magic Wings from the First To Shine mare Magic Shine. Lociano Duenez was riding. La Mos Corona extended her win streak to six following another powerful performance in the $50,000 Flashy Hemp Stakes. The daughter of multiple stakes sire Coronas Leaving You defeated Blue Eyed Fance by half-a-length while completing the 330 yards in :16.614 seconds, a 99 speed index. Trainer Orlando Orozco saddled the bay filly for owner M&M Stables, Inc. Bred by Oscar Rohne, La Mos Corona is out of the multiple stakes winning Heza Fast Dash mare La Mos Chingono. She has compiled a (19) 8-5-1 record and after pocketing $30,000 for tonight's win her bankroll total is $165,177. 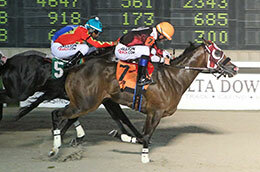 Mardi Gras Futurity(RG2) winner Blue Eye Fance earned $10,000 for her second-place effort. Trainer Jose Sanchez III conditions the lightly raced daughter of Jess Louisiana Blue for owner Valerie Moya. Alejandro Moya bred the bay filly from the Reckless Dash mare Fance Loretta. She has earned $148,402. Eddie Sanchez was in the saddle. Tk Zoomaway, under Delta Downs 2018 leading rider John Hamilton, finished a neck back to take third for owner-trainer and breeder Lanny Keith. He Zoomin For Bux filly, out of Stol The Day by Stoli, earned $5,500 for her effort. Sweet Caliente Royal raced to his second consecutive win Saturday night when he defeated Gamelee by half-a-length in the $40,000 Starter Claiming Stakes (not black type). Trainer Benjamin Wilbanks saddled the 3-year-old son of Corona Caliente to his third career win for owner Bulldog Racing. Ridden by jockey John Hamilton, the bay gelding completed the 350 yards in :17.588 seconds to earn a 92 speed index and pocket the winner's share of the purse worth $24,000. Ricky Bowen bred Sweet Caliente Royal from the Toast To Dash mare Sweet Last Toast. He has earned $57,464. Runner-up Gamelee pocketed $8,000 for owner Rayne Knight and trainer Michael Zingelmann. 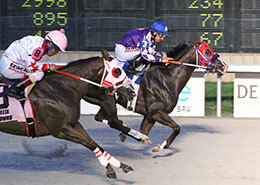 Donell Blake had the riding assignment aboard the Game Patriot 5-year-old out of Zobilee by Dashin Bye. Bred by Zingelmann and Curtis Crenwelge, Gamelee has earned $70,588. Jls Shades Of Gray, a 3-year-old daughter of Sir Runaway Dash owned-and-trained by Joe M. Davis, finished a nose back in third to pick up $4,400. 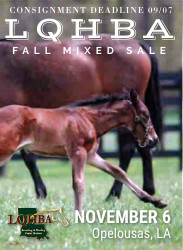 Jls Speedhorse Ranch, Inc. bred the gray filly from the Andalay Get mare Jls Ms Get Reb. Rolando Pina was riding.